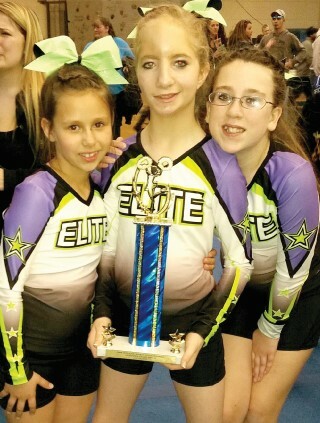 Westbrook Elite Northern Stars Cheerleaders in grades three through eight competed at its second competition of the season at the Poland Spirit Invitational placing first in its division. The joy of receiving this trophy brings spirit to all of the schools the team represents, said one of the parents. Team members Neverah Economeau of Falmouth (left), Brooklynn Hennigar (center) and Kaitlyn Kennedy (right) both of Windham hold up the trophy. 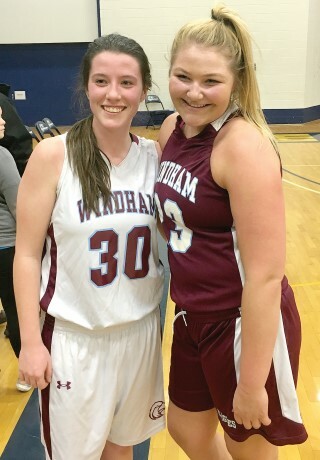 Windham High School girls hoop is just finishing with two members of this year’s Lady Eagles team, selected to play in the Southern Maine Senior All-Star game, sponsored by the Red Claws and Southern Maine Community College Athletics. Sadie Nelson and Julia Linevitch both were key contributors in this high scoring affair. Submitted story and photo. 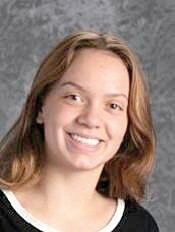 The Aroma Joe’s athlete of the week is Katharyn Lucas, an eighth grader at Windham Middle School. Katharyn is a swimmer on the middle school team. 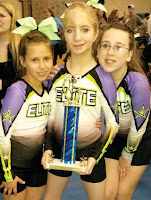 “Katharyn is a very hard worker in practice. She is a very positive teammate. She is a very good swimmer and I look forward to seeing her swim in high school,” said coach Brett Turenne. Her sports hero is Olympic swimmer Katie Ledecky. Katharyn has learned that “A simple good job can change someone’s race around,” she said. She knows it’s important to have good time management skills to get her work done. Katharyn enjoys having out with friends and listening to music. She would like to be a chef in the future. Katharyn is the daughter of Abbey Davies and Patrick Lucas. She has a sister Elizabeth. Sam Frank and her father, Ed. 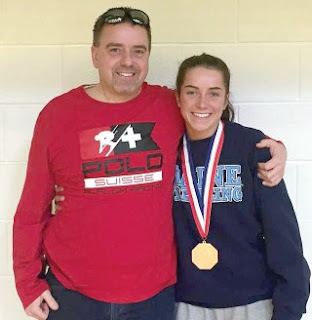 When Samantha Frank left Windham High School as the national runner up her senior year, she didn’t think she would wrestle again. As a nursing student at the University of Maine at Orono, she knew she would be busy. However, the best laid plans were put aside and Frank, now a sophomore at UMaine studying nursing is heading to Kissimmee, Florida, with her team to defend her national championship from her first college season. “I was hoping to get back into this position,” Frank said. This year Frank has been working on little things to improve her technique. She knows that other competitors are watching everything she does to be able to defeat her. She is dropping a weight class this year from 110 which she weighed last year to 101 and lighter this year. “It’s pretty hard. I’ve always love eating and all food,” Frank said. She talked about struggles to live in the dorms where pizza, pasta and bagels are the foods of choice. “No thanks. I’ll stick to my can of tuna,” she said with a laugh. She started the season at 117 pounds after a season of rugby. Her plan in Florida is to win. “I plan to do what I did last year and not psych myself out. I have a huge target because I’m a defending champion. I’ll have to watch my back, staying unaware even though I’m fully aware of what’s going on,” she said. The competition is a three day, double elimination tournament. 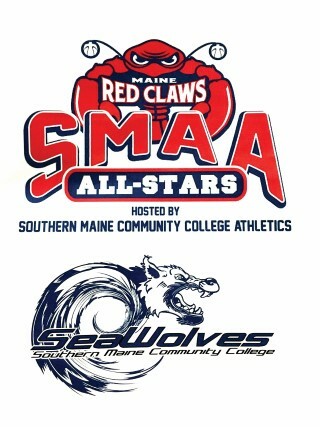 The UMaine team is considered a club sport so there are no scholarships for the athletes. Frank beat girls this season who were on full wrestling scholarships to other colleges. This is the third year for the UMaine team and only has two girls. However, women’s wrestling is the fastest growing college sport in the last year or two, said James. It has grown by the thousands over the last 10 years. “Things are going well,” Frank said. There are a lot of new wrestlers in the field and that means that she has more people to practice against. “[James] has put in so much time with me. Getting my cardio up and training, and one on one practices,” Frank said. James told her that “If you work hard enough and no one has worked harder than you, you’ll remember that when you are on the mat.” He also told her that if she wants to be there best she has to train like it. So she has. Sam Frank and coach Aaron James and a team mate. In addition to her nursing classes and wrestling, Frank is now a resident assistant (RA) and plays rugby. “It’s kind of hard to balance everything,” she admits. Frank tours the state speaking to local wrestling clubs and also coaches for wrestling teams. Updates from the competition can be found on University of Maine Orono – NCWA Wrestling Team. Eighth-grader Andrew Martin is the Aroma Joe’s athlete of the week. The 13-year-old Windham Middle School student plays soccer, track, hockey and wrestles. When he’s not competiting he enjoys video games and hanging out with friends. “Wrestling is a physically demanding sport but demands even more mental discipline. I have had the privilege of coaching Andrew in wrestling for the past three years and have watched him grow not only in his skill as a wrestler, but more importantly into a young man of character. I pride Andrew in his ability to win and lose with the same integrity, and focus on improving himself day by day. He is a joy to be around and I look forward to seeing him grow as an individual in the years to come,” said coach Nathan Johnson. Andrew’s sports heroes are Logan Stieber and Kyle Dake, both wrestlers. Balancing sports and school keeps Andrew on his toes. “You have to focus on school work first, sports second,” he said. “Teamwork motivates me not to think of myself first, but of my team instead,” he said about teamwork. Andrew lives with his mom and dad Theresa and Jim Martin and his sister, Katie Martin. He would like to wrestle for Ohio State or Penn State after he graduates from high school. 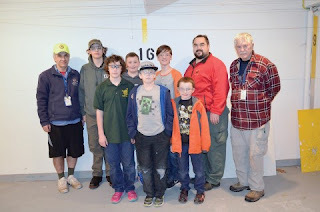 Appling Bulldogs defeated Scarborough Fish and Game 1816 to 1335 in the Orions National BB Gun League Distinguished Division. With the win, Appling Bulldogs is in first place, with a 4 - 0 record. Appling Bulldogs is from Baxley, GA, and is coached by Jeffrey McLellan. Scarborough Fish and Game dropped to 0 - 4 on the season. They are currently in eighth place. Scarborough Fish and Game was led by James Loft from Standish, who shot a 306. The remaining contributing members were Clayton Locke, Evan Gurry, Jon Loft (Standish) and Charlie Loker. Scarborough Fish and Game is from Scarborough, ME, and is coached by Roy Gorman. Next up Scarborough Fish and Game will compete against Buffalo 4-H from Kearney, NE. Buffalo 4-H currently has a 0 - 4 record. This match comes from week five of the Orion National BB Gun League. 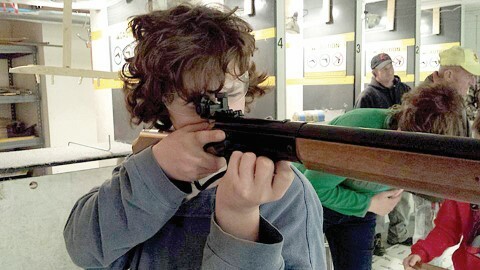 Sponsored by the Orion Scoring System, is a national team league for 4-H and junior rifle clubs. In an 8-week regular season, teams from across the country compete in a round robin win-loss league format. At the end of the season the top four teams will compete for the league championship in a single-elimination tournament. For more information visit http://www.orionscoringsystem.com/BBGunLeague. It has been a long time in coming for both the girls and boys Basketball teams at Windham High School and to get this award in the same season for the same sport is a recognizable event. 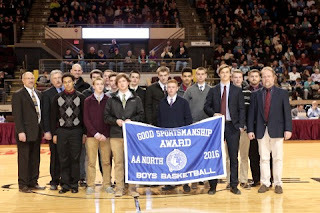 Last Saturday night both teams attended the Championship games at the Civic Center to accept sportsmanship banners on behalf of Windham High School. “To date WHS has won seven MPA good sportsmanship banners this school year: Boys cross country, girls cross country, golf, field hockey and volleyball. Recently we were notified that boys and girls basketball are each recipients of this honor bringing the total for the year to seven banners. To win one sportsmanship banner in any given school year is a feat and something to be proud of but to be a part of seven with the spring season still to go is something special. It's always nice to have competitive teams but to have competitive teams who add this to the mix is outstanding," said RSU14 athletic director Rich Drummond. Rich Drummond has been the main reason the athletic programs have been honored with so many sportsmanship awards this year. He has been vital in my first year as a coach and is consistently reminding me since I was hired of the importance of sportsmanship,” said boys varsity coach Chad Pulkkinen. The sportsmanship award isn't an individual award but a team award, to have all the players work together can be a tough feat. “High school athletics teaches you how to deal with adversity, and maintaining a positive attitude on and off the court allows you to get over bumps in the road quickly and move on the next game," said girls varsity coach Brody Artes. "Coming in as a new coach, culture was the most important aspect I wanted to build up within our team/program. All our coaches echoed my demands on how we wanted to conduct ourselves at practice, on the bus, at home and at away games and in the classroom. We felt if we continued to remind them of the importance of body language, attitude and being good teammates that our culture would strengthen. The kids really took ownership of their actions and represented Windham positively throughout the season," said Pulkkinen. “Zach LaCombe and Kyle Kilfoil never got rattled or showed any signs of poor body language in any situation. They never lost their composure. When you have that type of an example, especially with the young team we have, it becomes contagious. I think that is a reflection of the parents and how these kids are raised." Artes agreed. "When coaching an athletic team it’s important to make sure that you coach emotions as well as skills. It’s important to foster a level of confidence in your players so that they can compete at a high level, but it’s also equally important to prepare your players for the emotional side of the game. Basketball is a game of runs, and with each game comes those moments in which you go on an 8-0 run, or the other team goes on a 10-0 run, and you have to be mentally prepared to handle that and deal with that throughout the season. We talk a lot about what our reactions should be to the physical mistakes that we make on the floor, and a lot of times those physical reactions to mistakes have to come with a positive mental reaction on the very next play." "As their coach, I feel responsible for the way they act on the court during the course of a game,”Artes continued, “but I also think the girls did a very good job at maintaining composure this year and holding each other accountable. 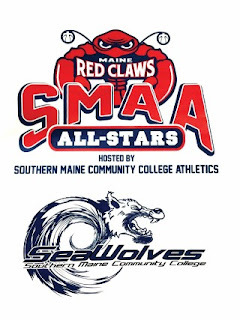 We played at South Portland this year when SMAA Player of the Year Maddie Hasson achieved her 1,000 career point, and several South Portland parents, school officials and community members approached me after the game saying how much of a class act our players were, as well as our parents." “For the boys team to win this award for the first time in over 20 years is truly a representation of our administration, athletic department and the parents. Our student athletes at WHS are consistently exemplifying what the school leaders and community is all about. It is an unbelievable honor to achieve the first AA North Sportsmanship Award and I am so proud of our guys for the way they handled themselves as student-athletes throughout the year,” Pulkkinen said. “At the end of the day, all of the adults involved (coaches, parents, administrators, community members, etc.) in a player’s high school athletics experience should hope that we prepare our athletes to be a positive influence on society after high school, and if we work together to achieve that for all of our student-athletes, then we have done our job – regardless of the outcome of a game,” Artes concluded.